Rachel Barton Pine's Blues Dialogues album and Music by Black Composers educational project are part of a mission that stretches back more than 20 years. Growing up in Chicago, Rachel Barton Pine took it for granted that there was a great body of classical music by black composers. She heard it on the radio. She played it in local orchestras as a student. The Center for Black Music Research is in Chicago. So, when the violinist recorded her first concerto album in 1997, she naturally included music by Afro-Caribbean and Afro-European composers. "I wasn't thinking about any of the social justice aspect or anything like that," Pine says. "But after the record came out, I started getting a huge number of requests from students and parents and teachers about, you know, 'Where can I find repertoire like this for kids of different levels?' "
So she began a nearly 20-year quest to catalog as much of this music as she could find. She had some time on her hands: Two years earlier, she was caught in a closing Chicago train door and dragged 200 feet. She lost one leg and severely damaged the other, and had more than 40 surgeries. But during the long recovery process, she devoted some of her spare time to searching for music. "You know, going to the Library of Congress and digging up the one copy of this and that, and going to the Haiti music archives in Montreal. Going to the attic of the composer's grandniece to sort through unsorted boxes of papers and manuscripts. I mean, there have been some amazing archaeological adventures," she says. One of the pieces she found was a 1927 work called "Levee Dance," by the Tennessee-born composer Clarence Cameron White. It's one of the pieces that Pine has recorded for a new album called Blues Dialogues, for violin and piano. "My parents would put on Chicago blues records when they weren't playing the classical station when I was growing up, and it's just sort of been in the air," she says. "I mean, I really consider it to be my indigenous music — of, you know, of where I live." Another of the composers featured on that album is Billy Childs — a Grammy-winning Los Angeles-based composer and pianist. Childs got a cold dose of how the classical establishment felt about composers of color when he went to the University of Southern California to study classical composition, with a side of jazz performance. "It seemed as though, often, I wouldn't be taken as seriously as a composer steeped in the European tradition of music because of my jazz background," Childs says. "But that also had kind of a racial overtone to it." It's this attitude that Pine is trying to change with her Music by Black Composers project. She's working with the Curtis Institute of Music in Philadelphia, the Dallas Symphony's Young Strings program and Project STEP in Boston to introduce young musicians to composers and works that Billy Childs had to find on his own. "Alvin Singleton is really great, you know?" Childs says. "I love Bill Banfield's work. Jessie Montgomery is a great composer. Valerie Coleman. Tania León. One of my favorite pieces ever written is by George Walker, and it's a trombone concerto." All of those composers are part of Pine's free online database, which includes more than 900 works by more than 350 composers from multiple continents. The Music by Black Composers project has also published a new book for beginning violin students, the first in a series — as well as a coloring book and a timeline poster of around 300 composers. "I'm particularly excited to inspire African-American children," Pine says "so that they feel like they're part of classical music's history and future — but also to normalize diversity of repertoire for all students, so that they grow up with this stuff, and aren't satisfied with having concert experiences, when they grow up to become audience members and performers, that don't reflect the totality of the human experience. Childs says he's is grateful for the Music by Black Composers project, but he also hopes it helps make projects like it obsolete. "The great legacy of music written by African-American composers is not called 'music by African-American composers,' but called 'music by composers,' where the qualifying term doesn't pigeonhole it and relegate it to some corner of the room — you know, African-Americans over there, and 'regular' composers over here," Childs says. "I would hope that this project makes that unnecessary, so that we are looking at all music just like Duke Ellington said: good or bad." Composers of color have long had to fight for a place in the classical canon and on the concert stage. In fact, many classical musicians and students at all levels are unaware of the wealth of music by black composers. 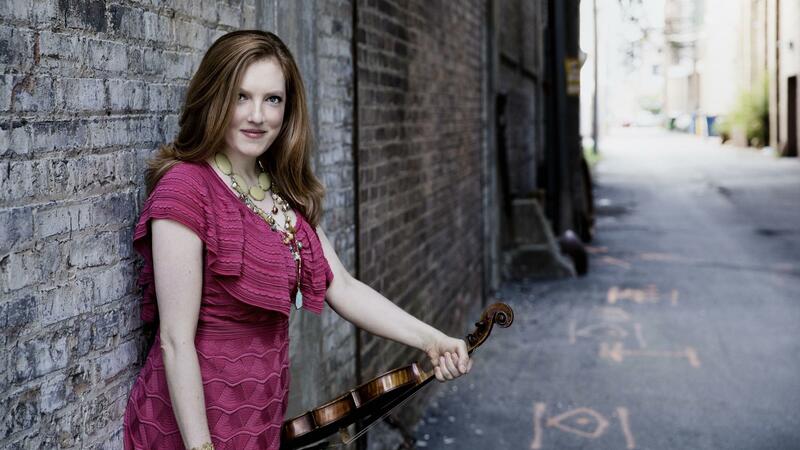 A new project spearheaded by violinist Rachel Barton Pine seeks to correct that, especially, as Tim Greiving reports, for the next generation of music makers. TIM GREIVING, BYLINE: Growing up in Chicago, Rachel Barton Pine took it for granted that there was a great body of classical music by black composers. GREIVING: She heard it on the radio. She played it in local orchestras as a student. The Center for Black Music Research is in Chicago. So when she recorded her first concerto album in 1997, she naturally included music by Afro-Caribbean and Afro-European composers. RACHEL BARTON PINE: I wasn't thinking about any of the social justice aspects or anything like that. But after the record came out, I started getting a huge number of requests from students and parents and teachers about, you know, where can I find repertoire like this for kids of different levels? GREIVING: So she began a nearly 20-year quest to catalogue as much of this music as she could find. She had some time on her hands. Two years earlier, she was caught in a closing Chicago train door and dragged 200 feet. She lost one leg and severely damaged the other and had more than 40 surgeries. But during the long recovery process, she devoted some of her spare time to searching for music. PINE: You know, going to the Library of Congress and digging up the one copy of this and that and going to the Haiti music archives in Montreal, going to the attic of the composer's grandniece to sort through unsorted boxes of papers and manuscripts. I mean, there have been some amazing archaeological adventures. GREIVING: One of the pieces she found was a 1927 work called "Levee Dance" the Tennessee-born composer Clarence Cameron White. GREIVING: It's one of the pieces that Pine has recorded for a new album called "Blues Dialogues" for violin and piano. PINE: My parents would put on Chicago blues records when they weren't playing the classical station when I was growing up. And it's just sort of been in the air. I mean, I really consider it to be the music of, you know, of where I live. GREIVING: One of the composers featured on that album, who also serves on the committee for Pine's new educational project, is Billy Childs, a Grammy-winning Los Angeles-based composer and pianist. GREIVING: Childs got a cold dose of how the classical establishment felt about composers of color when he went to the University of Southern California to study classical composition with a side of jazz performance. BILLY CHILDS: And it seemed as though, often, I wouldn't be taken as seriously as a composer steeped in the European tradition of music because of my jazz background. But that also had kind of a racial overtone to it. GREIVING: It's this attitude that violinist Rachel Barton Pine is trying to change with her Music By Black Composers Project. She's working with the Curtis Institute of Music in Philadelphia, the Dallas Symphony Young Strings program and Project STEP in Boston to introduce young musicians to composers and works that Billy Childs had to find himself. CHILDS: Jessie Montgomery is a great composer, Valerie Coleman, Tania Leon. You know, one of my favorite pieces ever written is by George Walker, and it's a trombone concerto. GREIVING: All of these composers are part of Rachel Barton Pine's free online database, which includes more than 900 works by more than 350 composers from multiple continents. Pine's Music By Black Composers project has also published a new book for beginning violin students, the first in a series, as well as a coloring book and a timeline poster of around 300 composers. PINE: I am particularly excited to inspire African-American children so that they feel like they're part of classical music's history and future, but also to normalize diversity of repertoire for all students so that they grow up with this stuff and aren't satisfied with having concert experiences that don't reflect the totality of the human experience. GREIVING: Composer Billy Childs is grateful for the Music By Black Composers project, but he also hopes it makes projects like this obsolete. CHILDS: And the great wealth and the great legacy of music written by African-American composers is not called music by African-American composers but called Music By Composers so that we are looking at all music just like Duke Ellington said, good or bad. GREIVING: And available. For NPR News, I'm Tim Greiving. [POST-BROADCAST CLARIFICATION: In this report, we state that Billy Childs "got a cold dose of how the classical establishment feels about composers of color when he went to the University of California." Childs said during an interview with NPR that he became "aware of race in music" when he studied composition at USC. But since this story aired, he has clarified that he encountered racism in the music world after graduating from the school, not while he was a student there.] Transcript provided by NPR, Copyright NPR.